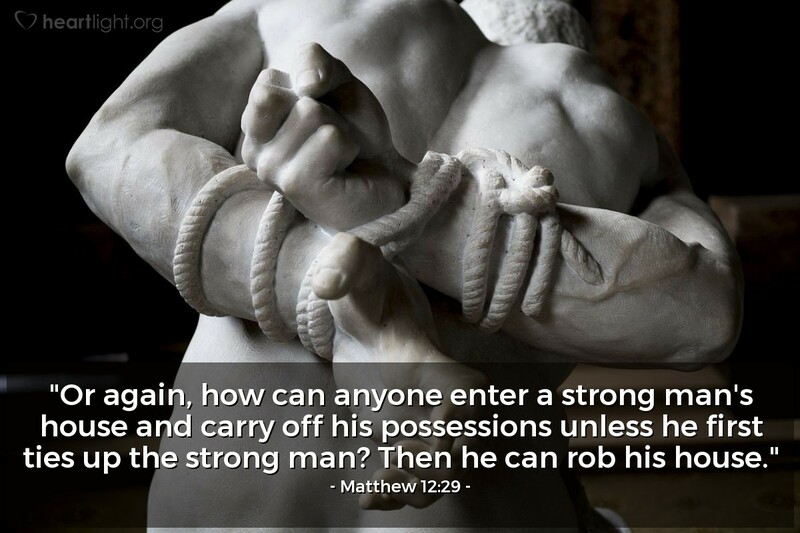 "Or again, how can anyone enter a strong man's house and carry off his possessions unless he first ties up the strong man? Then he can rob his house." Jesus is quoting a general truism that was popular in his day, but was using the "strong man" saying to refer to Satan. Satan is the strong man that had us bound by sin and death and Jesus broke into house and stole us back because he could bind the strong man. He did this by becoming human and facing death with complete obedience to God and then rose from the dead to defeat death and give us life! Praise God! Jesus broke into the Strong Man's house. He overpowered him and bound him. And, what did he bring out of the Strong Man's house? Buried treasure, of course! And that treasure is us!! Thank you, Lord Jesus, for rescuing me from the dominion of darkness and ushering me into your victorious Kingdom of Light! Amen.